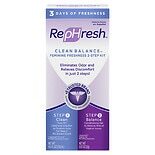 Shop RepHresh Clean Balance Feminine Freshness Kit 2 Part Kit (4.57 oz. )4.57 oz. Shop RepHresh Vaginal Gel Prefilled Applicators (.07 oz. ).07 oz.